Creating a good submission is obviously critical if you're to have any chance of winning awards. But with entry criteria and judging processes varying between different awards programmes, and terminology being open to interpretation, how can you ensure that you're presenting the correct information in the best possible format? 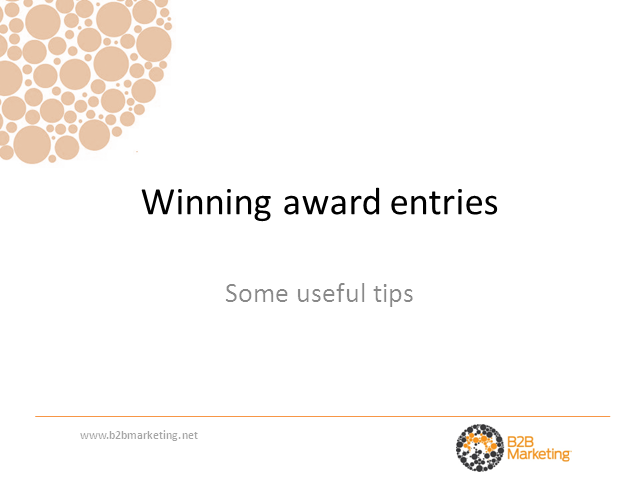 This presentation will run through what you need to ensure you have the best possible chance of winning a B2B Marketing Award in 2010. It’s presented by Peter Young, chairman of the judging panel for the past five years, and also features a Q&A hosted by Joel Harrison, editor of B2B Marketing.